Your roof underlayment, which is also commonly known as “felt paper,” is a layer of material that goes underneath the shingles or other roofing components. It is usually a roll of fiberglass or paper that has been saturated with various waterproofing materials. This is what makes it such an important part of your roof’s structure. Quality underlayment options, such as Weather Watch®, create an effective leak barrier that protects you from harmful water damage. Walls and ceiling stains due to leaks can be an unattractive annoyance, but worse than that they can lead to expensive and time-consuming repairs. Underlayment also helps to cut down on the leaks that result from water damming in gutters, as well as rain that is driven by strong winds. Additionally, the Mineral-Surfaced Leak Barrier by Weather Watch® is an integral part of the GAF Lifetime Roofing System. High quality leak barriers prevent the ice dams that may form on rooftops in colder climates. Underlayment materials make it water resistant enough to keep a roof leak-free in even severe storms. With the fiberglass reinforcement of underlayment beneath them, shingles are less prone to buckling and wrinkling up. They lay flatter for a more attractive appearance. Incorporating underlayment layers is actually a requirement in northern areas, due to the increased risk of complications related to heavy snowfall. Why Should Homeowners Invest in Underlayment? Shingles and roof tiles in general are the first defense against bad weather. However, your roof underlayment fills a crucial role in the protection of your home. The secondary level of waterproof materials serves as a failsafe, something to keep the wood underneath from getting exposed to harmful moisture if the shingles fail to do their job. Having this barrier in place improves the performance of your roof. This also means it will last you longer as the roofing materials are protected from early deterioration. Hopewell Roofing & Restoration is not only a GAF-certified Master Elite Roofing Contractor, but the work we perform provides a Lifetime ltd. warranty for Lifetime Shingle roofs. Even if your roof isn’t Lifetime designated, we can still provide you with a warranty period of up to 25 years! Our permanent work crews and commitment to customer satisfaction give us the ability to provide consistent, high-quality results for our customers. Get in touch with us about your roof’s underlayment today. Protects your home by helping to prevent costly repairs due to wall or ceiling staining. Help prevent leaks due to water damming in your gutters, wind-driven rain, and, in the North, damaging ice dams. 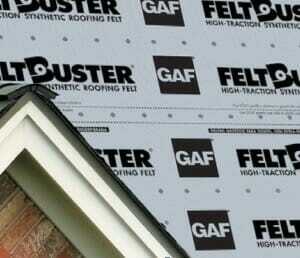 Looks Better: Fiberglass reinforcement helps resist wrinkling and buckling – lays flatter under shingles. Meets Building Codes: In the North, where a leak barrier MUST be used. Peace Of Mind: Up to a Lifetime ltd. warranty when used on Lifetime Shingle roofs, up to a 25-year ltd. warranty when used on non-Lifetime Shingle roofs..